This is one of the first flavors produced for sale by this company and was sent to me at no charge for the purpose of this review by Apocalypse Juice (Thank you Tony). Treat yourself to the summer bliss! A beautiful mix of kiwi, coconut and mango with a sweet kick makes this summer treat a must. Perfectly balanced flavors provide the most from this amazing flavor. All orders are shipped from their facility in Lockport, IL within two days of receiving payment VIA USPS first class bulk rate with tracking numbers as stated within their website. All liquids are made to order. Prices are $15 for each 30ml bottle and your shipping and handling charges are caluculated at checkout. Sample packs of three, 10ml bottles are also available for $15. The standard mix ratio is 50/50 in your choice of 0, 6, 12 or 18mg of nicotine. However, if you prefer a different PG/VG mix, just state your requirements in the comment section of the order from and you will be accommodated. My order was promptly shipped in a standard padded envelope. Inside were well filled glass bottles, inside a plastic Ziploc type bag surrounded by bubble wrap. No signs of leaking and no odor which in my mind means really well seated caps. The bottles themselves were standard glass bottles with a heavy plastic cap. No eye droppers are included so you are left to your own devices when it comes to transferring the liquid inside to whatever device you are using to turn it into vapor. I thought that this was a little odd and when I asked Tony about it, he told me his priority was to get his E-Liquid made and shipped to fill some really heavy demand and he is looking over his packaging options for the future.The bottles are clearly marked with the Apocalypse logo, name of the flavor, mix ratio and mg of nic and date of manufacture. 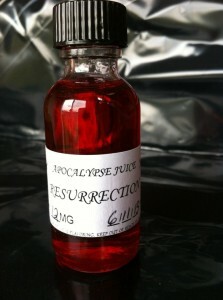 And this was a first for me, he has also added a scan-able QR code to the label to so if you have a friend that has tried and liked your Apocalypse Juice, they can just scan it with their smart phone and place an order. Pretty clever of them! The liquid inside is a clear bright orange color. And when it came time for the “sniff test” to me it had a light but distinct fruit or even fruit punch smell with some sweet notes to it. Kind of reminiscent of a freshly made batch of Kool-Aid. Normally I use a 60/40 mix of VG/PG. This time I forgot to specify so I ended up with a 50/50 mix with 18mg of nic. Anyway, I go ahead and fill up my Kanger ProTank with a 2.5ohm Evod head courtesy of Rick at Vapor Alley who is providing these heads for my reviews (Thank You Rick), place it on the business end of my Vamo and start at 3.4v and start walking it up the range until I settle in at 4.1v. This is a higher setting than I normally use but as (at least to me) this is such a light and complex flavor, I really needed the extra power to bring out the flavors and the throat hit I wanted. Tony at Apocalypse was spot on and dead accurate when he called this a perfect blend of flavors. 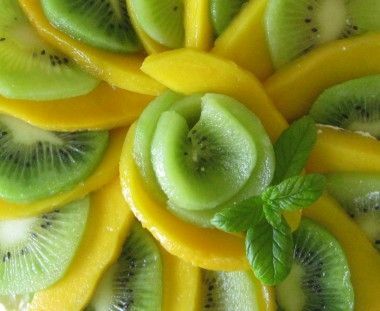 I know from the description on the website that it is made from a combination of Kiwi, Coconut and Mango. But when I tell my taste buds to search for the individual components I can’t positively separate them from the whole and identify them. Sometimes for a split second, it think one of the flavors is trying to get my attention and then it is gone. It is a successful blend of very light flavors, smooth and lightly sweet. Delivers a decent amount of vapor and a light throat hit that doesn’t detract from the flavor. With this E-Liquid, not a lot has changed over the week. Still vaping at 4.1v, vapor and throat hit remain unchanged. The flavor seems to be just a touch sweeter, a natural kind of sweetness that may be courtesy of the coconut component. And the mix of flavors continues to be well combined into a unified whole. Here is what Tony had to say……. While this one will not be an all day vape for me as I tend to prefer more aggressive flavors, I can see this having its own fan base. If you prefer flavors like Pina Colada, you should most definitely give this flavor a try. NEXT POST Next post: What Don’t we Know about Nicotine? Some Interesting Insight.